Most residents of and visitors to Superior, Wisconsin, consider Barker’s Island—located just off the Superior Bay shoreline on the eastern edge of the city—as the community’s recreational focal point. After all, it is the home of a marina, hotels and restaurants, public museums, the site of annual dragon boat races and pond hockey tournaments. Few of those who play on or around Barker’s Island know of its long and storied history, but the man-made atoll dates back to Superior’s boomtown days of the late nineteenth century and—so the story goes—was created out of spite. The origins of Barker’s lsland begin with the Rivers and Harbors Improvement Act of 1892, which mandated uniform 20-foot deep, 300-foot wide channels for all ports on the Great Lakes. Though much private- and city-funded dredging had taken place in the Twin Ports prior to the act, Federal dollars for improvement to meet these new specifications didn’t begin flowing into the area in great amount until the summer of 1896, when the federal government began improvements of both the Superior entry and the Duluth Ship Canal. That same year Captain Charles S. Barker began his dredging operations in Superior. Born in Syracuse, New York, in 1848, Captain Charles S. Barker was barely out of his teens when he began working for his father, who won the dredging contract for the improvement and enlargement of the Erie Canal. The younger Barker spent ten years working on the waterway. Many retellings of Barker’s tale date his arrival in Superior to 1885. However the Inland Ocean News reported he first visited the area on March 17, 1886, for the purpose of exploring business interests in Superior and Duluth. Barker was 37 years old and well established in his trade; he actually came to Superior at the behest of a group of business leaders in the community, including officials of the Northern Pacific Railroad and General John Hammond, owner of the Land and River Improvement Company. A key player in the city’s early establishment, Hammond was responsible for most of the development of West Superior. Recognized by local media as a man of great wealth when he first arrived, Barker increased his fortune through private, city and federal dredging contracts in the waters between Superior and Duluth. The local news outlets first portrayed Captain Barker as a humble and hardworking man, more concerned with getting the job done than with any notoriety. Despite his purported wish to avoid infamy, the Captain was hard put to stay out of the news over matters of business, particularly those involving money. In December 1891 Barker was indicted and charged for illegally dumping dredged material off of a scow into a government waterway in the St. Louis Bay. A few years later the Superior Times reported that one of Barker’s tug captains, R. B. Coburn, “was arrested on the charge of dumping scows within the dock line in the Superior harbor.” Coburn was found guilty and fined $250. For most of 1892 and well into 1893, Captain Barker also found himself in dispute with the City of Superior over collection of over $95,000 in bonds issued for dredging he had provided. Barker prevailed, but the city took until 1894 to pay off the debt. Other miscellaneous and trivial legal skirmishes involving Captain Barker pepper the region’s news periodicals throughout his time in Superior, but none was quite as sensational as the account of the 1891 attempt on the Captain’s life. According to the Superior Daily Call of October 19, 1891, Thomas Stanford—the estranged husband of Barker’s mother-in-law—arrived at Barker’s home carrying a loaded pistol. Stanford demanded to see his wife, who was residing with her daughter and Captain Barker. Stanford had visited Barker’s office earlier in the day, but the Captain turned him away and warned him against bothering his wife and her mother. The warning did not stop Stanford, who various accounts described as insane. At the Barker residence, he thrust the pistol into the Captain’s face and shouted, “Now I will get even with you for this afternoon.” He pulled the trigger once, but the gun did not fire. The two men grappled and the trigger was tripped twice more, firing on empty chambers both times. Most of Barker’s legal issues weren’t nearly as dramatic, such as his December 1892 lawsuit against the West Superior Lumber Company. Captain Barker filed suit against the lumber concern for non-payment of work completed. The lumber company claimed the dredging of two channels for which they’d contracted was not satisfactorily done. Captain Barker won the suit in the amount of $2,000. Barker cashed in on the federal government’s 1890s improvements of the Superior Entry and the Duluth Ship Canal. In 1896 he was awarded a contract by the United States Army Corps of Engineers for the dredging of over 266 million cubic yards of material in continuation of the deepening and widening of existing channels and basins in Superior Bay, Allouez Bay, and St. Louis Bay, as well as entrances to the harbor and a new channel in the flats of the St. Louis River. Local newspapers, including the Superior Call, Superior Leader and Inland Ocean News, regularly published brief reports of Captain Barker’s dredging activity and clearly indicate that tons of dredged material scraped from the lake bottom indeed created the small island in the Superior Bay. This new land mass was located directly in front of Fairlawn, the opulent 1889 Victorian estate of lumber baron and mining investor Martin Pattison, who had been elected Superior’s mayor three times. Perhaps playing off Barker’s legal disputes with the West Superior Lumber Company, a legend began to grow about why Barker picked that particular spot to dump the dredgings. Barker, the story went, was upset with Pattison because the lumberman raised the price of wood whenever Barker needed lumber—so in retaliation Barker had his dredgers dump material in front of Pattison’s mansion to ruin the lumber baron’s view. Some accounts of Barker’s life indicate that he and Pattison were friends. It is much more likely that Barker dumped dredgings where he did because it was a less expensive solution to moving the sand elsewhere by rail or boat. Barker had his own fleet of tugs and dredgers, but he despised rail and was quoted as saying that [rail] proved too costly to make dredging a worthwhile endeavor. An October 16, 1941, Superior Evening Telegram article debunking the legend agrees, stating that, “Had the sand not been conveniently dumped on the site, it would have had to have been carried out of the harbor by boats and dropped into Lake Superior.” But that would have taken time, manpower, and fuel that would cut into profits. Captain Barker passed of an apparent heart attack, on May 21, 1901, before work on the Superior Entry was complete. His company holdings were eventually sold to Duluth’s Lake Superior Dredging Company, and the work continued. Within 15 years of Barker’s death, the land mass appeared on maps. A 1914–1915 Department of the U.S. Interior Topography Map of the area clearly shows an island with what appears to be a roadway connecting it to the mainland at the northwest end of the island, but the land mass is not named or otherwise identified, suggesting it was then of little significance. Superior’s Barker’s Island, just off the eastern shoreline of Superior, is well-known today as a tourist attraction and recreation center. The island plays host to restaurants, a 420-dock marina, a luxury home community, a hotel and convention complex, and even a ship museum. Often considered the “jewel of the city” today, technically the isthmus is little more than a pile of dredged sand, the byproduct of five years of dredging by Charles S. Barker and his crew to improve the Superior Entry. It took more than a half century for Superior to recognize the island’s potential, and today it stands as an enduring legacy to Captain Barker. By the early 1920s residents of Superior had co-opted Barker’s Island as a popular playground for picnicking, swimming, fishing and boating. But for several years the city dumped raw sewage into the bay, making swimming unsafe; the island soon became a far less pleasant destination. As the popularity and affordability of automobiles increased, travel to inland lakes became more convenient and Barker’s Island fell out of favor. But Barker’s man-made island was not about to sink into the bay, forever forgotten. In 1945 the Superior Chapter of the Audubon Society claimed the strip of land and designated it a bird sanctuary in order to protect the Piping Plover. Reasoning that the only rightful owners of the sand bar would be descendants of the early Ojibwe population who staked claims that extended into the water, the society was willing to take the chance that no one would ever make a legal claim on the land. They were wrong about the ownership—the property belonged to the Great Northern railroad—but guessed right that there would be no dispute over the property. While discussion of developing the island as a recreational site began as early at the 1950s, the bird sanctuary was rarely threatened, as improvement plans were repeatedly moved to the back burner in favor of more pressing city projects. In 1954 dredging operations to maintain the channel once again resulted in depositing sand on the deteriorating island, filling in low spots and widening the existing sand bar about a block in width along the entire length of the island. In 1958 the city constructed a modern causeway to the island, which shaped its future (and likely reinforced the shoreline at the same time). While intended for use by city workers, the roadway provided easy public access to the island. For years afterwards the island became the launch site for the city’s Independence Day fireworks show, but it wasn’t until 1972 that the isthmus truly became a tourist and recreation destination. The museum was an instant success, receiving thousands of visitors annually during its first several summers of operation. That success revived discussions of developing the island as a recreation site and tourist destination. The following year Duluth’s Harbor Excursion Co., which first operated tours of the Duluth-Superior Harbor aboard the vessels Flame and Flamingo beginning in 1959, expanded to Superior and built a dock, ticket office and boarding site on Barker’s Island. About the same time the company changed its name to the Vista Fleet. In March of 1974 the question of who owned the island was finally cleared up when the Burlington Northern Railroad (formerly the Great Northern and now Burlington Northern Santa Fe, Inc.) transferred the property to the city of Superior—a gift with an estimated value of $600,000 at the time. 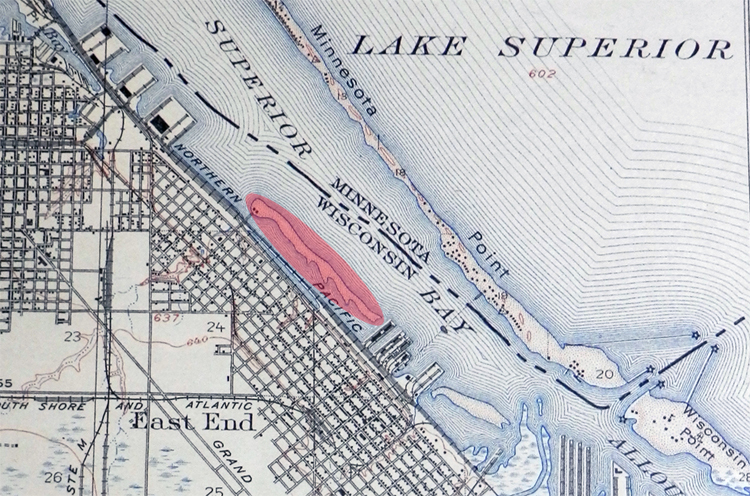 Though preservationists would object to further development of the island, causing the state of Wisconsin to challenge the city in court, eventually jurisdiction over most of the island was granted to the city. As a compromise, fourteen acres of the south end were fenced off to remain as a bird sanctuary. Development began with a boardwalk and about half a dozen small retail shops—both city-owned and leased—offering gifts, souvenirs and refreshments. Additional amenities added over the next several years included a pavilion, a park and play area, trails, a miniature golf course, a fine dining restaurant, a boat launch and a beach and swimming area. The city next erected a ten-foot bronze statue, William Frost’s Seaman’s Memorial, on the north end of the island. The statue commemorates the 29 men who lost their lives when the Edmund Fitgerald sank on November 11, 1975. In 1977 Superior voters overwhelmingly approved the construction of a marina and hotel on the island. The city received a $3.7 million federal grant for marina construction, and in 1980 the Barker’s Island Marina opened for business. Two years later the Radisson Inn & Yacht Club—now the Barker’s Island Inn & Conference Center—was complete. The island became a hub of activity and the site of numerous community events. In the late 1980s, after determining that no Piping Plovers had been seen on Barker’s Island since 1960, the State released the bird sanctuary to the city, freeing up those 14 acres for development. That same year Jack Culley—owner of Sailboats, Inc., which operates the marina—and two partners formed the Barker’s Island Development Corp and purchased 10 of those reclaimed acres. Culley moved into the island’s first home, and the company eventually built 20 townhouses and seven single-family houses. By 2000 talk began for plans to renovate the north end of the island to better compliment the south end’s upscale housing community, including replacing the deteriorating boardwalk and wharf shops. In a series of open meetings, the city arrived at an ambitious plan. The estimated $1.2 million idea included construction of a new and expanded retail space with boardwalk and lighting, a charter fishing dock, redesigned public parking, a playground, a perennial garden and a festival park with a band shelter, trails, a boat launch and swimming beach complete with restroom facilities. The city received nearly $1 million in federal funding and other grants toward the project. Demolition of the existing boardwalk and shops began late in 2004. That same year, Vista Harbor Cruises invested $3 million in improvements to their dock and boarding area to accommodate the mooring of a ship. They added a modern, twin-peaked building to accommodate ticket sales and a gift shop, leasing additional space to Deco Bay Bike and Kayak, Cheese to Please, and Kanine Krunchies. Unfortunately, the development on the island’s north end coincided with a national recession. The Boathouse restaurant closed it doors in April 2009; that the same year Vista Fleet shut down their Superior operations, citing a decrease in boarding and activity. Today the Lake Superior National Estuarine Research and Reserve facility and laboratory occupies the former restaurant and Vista Fleet building. Where retail failed, new housing continues to succeed. The Barker’s Island Development Corp. purchased the former bird sanctuary’s remaining four acres in 2010, planning to build six to 12 homes, some of which are currently under construction. Captain Barker’s Island remains an important resource and recreational site in the Superior community, with the largest full-service marina on the Great Lakes attracting boaters from hundreds of miles around the Twin Ports, including a large contingency from the Twin Cities. The island also continues to hosts the Lake Superior Dragon Boat Festival, the Great Lakes Pond Hockey Classic, the Barker’s Island Farmer’s Market, concerts by Bayside Sounds, and many other events.